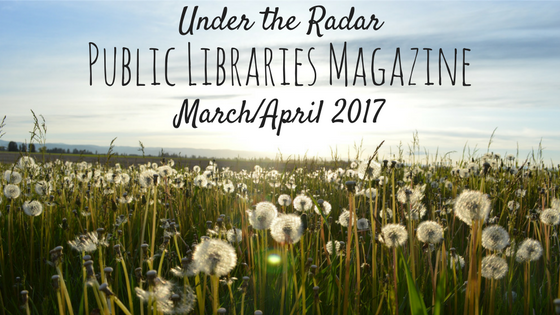 Contributing Editor KAITE MEDIATORE STOVER is Director of Readers’ Services at Kansas City (MO) Library. Contact Kaite at kaitestover@gmail.com. Kaite is currently reading The Force by Don Winslow (June 2017) and listening to Bellwether Friends podcast. At the top of the request list is Hillbilly Elegy: A Memoir of a Family and Culture in Crisis (2016) by J. D. Vance. This book shot to the top of everyone’s list after a bewildering election. Vance’s painfully honest look at the white working class and its descent into poverty will prompt discussion of why President Trump won this demographic. Readers will also get caught up in Vance’s personal story of success through hard work, yes, but he gives most of the credit to a community and family that sustained him. Carol Anderson’s White Rage: The Unspoken Truth of Our Racial Divide (2016) is another engaging, eye-opening, conversation-provoking title book clubs have been demanding to read. Anderson uses flash points from the Civil War to the Black Lives Matter movement to show how whites have used public policies to disenfranchise black voters. Readers have been asking for books on other social justice issues. They have been using fiction to explore issues of abortion and racial profiling. A young adult novel, The Hate U Give (2017) by Angie Davis is sparking conversation among teen and adult groups alike. This hefty, detailed, and compelling first novel is a great bridge between generations looking to confront hard questions surrounding racism and police violence. Pair this teen novel with the memoir of a teen’s too-brief life as told by his anguished parents, Rest in Power: The Enduring Life of Trayvon Martin (2017) by Sybrina Fulton and Tracy Martin. Readers will come to know the exuberant teen and experience the deep sorrow and heated rage of his parents as they unwittingly help launch a movement when all they wanted were answers and justice for their son. Another debut novel, The Mothers (2016) by Brit Bennett, lets readers see the positive and negative sides of a life once a woman exercises her right to choose. There are no villains here, but there are plenty of believable, likeable, flawed characters who spend years consciously and unconsciously dealing with fallout from one person’s decision. Consider adding Evicted: Poverty and Profit in the American City (2016) by Matthew Desmond and Another Day in the Death of America: A Chronicle of Ten Short Lives (2016) by Gary Younge to the rotation. Both tackle hot-button issues with careful thought and convincing prose that bring the issues out of the think tanks and into the lives of everyday readers. Supplement the reading with some documentary viewing. Newtown (2017) is a stirring documentary about the mass shooting in Newtown (CT) at Sandy Hook Elementary School. This thoughtfully constructed documentary looks at the aftermath of the tragedy and its survivors and moves smoothly to questions about gun control. A shocking film about the history of race, justice, and mass incarceration is 13th (2016). The New Jim Crow: Mass Incarceration in the Age of Colorblindness (2010) by Michelle Alexander has been a popular book for discussion and obviously pairs well with 13th as would Anderson’s White Rage. Expect more book clubs to ask for books with difficult subject matter that challenge belief systems, explore values, push boundaries, and get everyone out of their reading comfort zone. Those are the hallmarks of a successful discussion—engaging in civil discourse to reach common ground.